Forever a cinematic alchemist – a sage that conjured and devoured celluloid before the eventual ritualistic sacrifice- Derek Jarman is the perfect suitor to Shakespeare’s The Tempest (1979); a play whose heart is bathed in the tragedy and power of magic. Of course Jarman isn’t the only person from the Brit-pack of avant-garde directors to remould the work but his is the most natural. Peter Greenaway delved deep into the play’s waters in Prospero’s Books (1991) and rather successfully too. Yet Jarman’s adaptation seems fitting because it further heightens his own contradictory image, the first true dualistic embodiment in cinema of both the proud classicist and the staunch modernist. Something strangely beautiful happened during this period of British cinema. These classical modernists were almost a norm in a trend set by Jarman as funding bodies sought to produce projects purely on their artistic merit rather than financial potential (which was very clearly all but ignored). Jarman and the previously mentioned Greenaway are part of the roster of filmmakers that this allegiance to creativity produced along with filmmakers such as Sally Potter, Bill Douglas, Terence Davies, and a handful of others. They are surely days to bemoan and mourn. The Tempest is a quintessential part of this movement, being a product of its chief provocateur. Its classical text is reformed into a luscious visual palette of a film, filling the walls of Bamburgh Castle with high calibre pomp. All of these elements seem to be part of this same movement with the film world of Britain deciding that its most famous classical stars and texts of the stage were ripe for the most avant-garde of projects. In this case, The Tempest boasts Christopher Biggins’ Stephano, the drunken letch whom is both humorous and vulgar, as its main “luvvie”. Unlike his peers though, Jarman stopped here for casting classical stage performers and instead turned to more interesting avenues for his story of magickal exile. Whereas Greenaway would stock his films to the brim with names (Joan Plowright, Michael Gambon, Helen Mirren, etc. ), Jarman delved back into his punk ways and cast Toyah Willcox as Miranda the daughter. Jarman had already defined cinematic punk the year before in Jubilee (1978) with some help from Willcox, and so to bring elements of this into Shakespeare is one of most Jarman-esque things he could do; a norm of the director for complete creative abnormality in the most exhilarating of ways. In this sense, Jarman is still working as the punk shaman, fizzing the classical through a strange prism of the lurid, the grotesque, and the rebellious. But what of the story and its presentation? It’s a narrative that has been presented in a multitude of fashions from the classical (John Gorrie’s adaptation for the BBC in 1980) to the pulp (Fred M. Wilcox’s Forbidden Planet in 1956) so where would Jarman have left to go? The late 1970s seem to mark the beginning of the painterly British art film where visuals mixed the lavish with the Gothic. Building on this idea alone, Jarman easily escapes many of the clichés by creating an island of exile that is in itself the visual embodiment of the atmospheric. The castle of the isle is full of jewels and straw creating a contrast of beauty and filth, just like the characters. The tale becomes sordid but also meaningful; this was made after all in the glutinous dredges of the neo-liberal movement that Jarman himself would eventually strive to fight against. This thing of darkness at the very least needed acknowledging. Yet The Tempest isn’t simply about inner evil or inner desire; it’s a role-play about the caricatures of power and their attempts at gaining upon the walls of others. In one sense, Shakespeare’s original play acts as a template for several of Jarman’s later projects, many of which pushed the portrayal of this power-play to an almost unbearable level of excess (see 1990’s The Garden or 1988’s The Last of England). The world was new but no longer brave, only those who were forced to suffer its injustices and survived could countenance such harshness. It’s perhaps sad that Jarman didn’t make The Tempest in the mid 1980s when his political and social anger would have been of a far higher temperature and the winding watch of his wit would have had longer to tick away in sheer frustration. 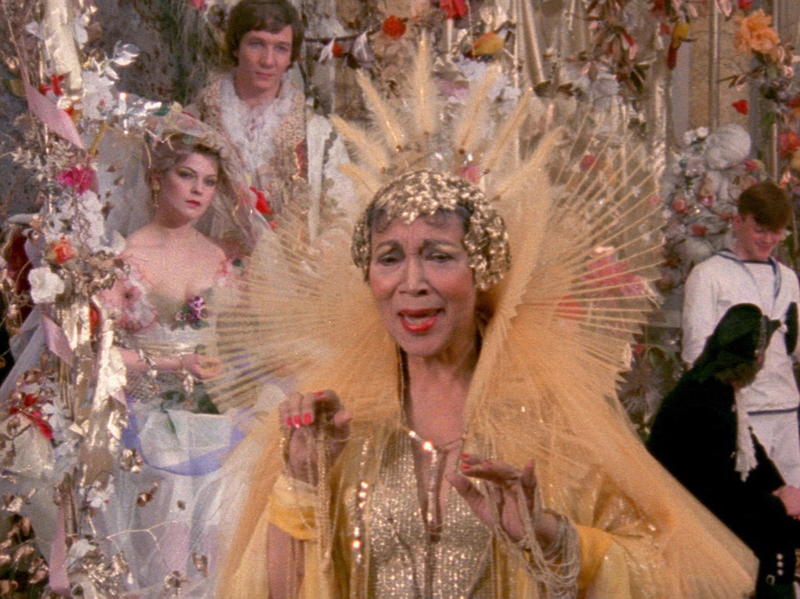 Still, Jarman’s adaptation of the work bears all the hallmarks of his true greatness as an artist. There’s a tendency with classical stage adaptations, especially those of our illustrious Bard, to be dealt the baggage of snobbery by the more theatrically inclined of viewers. Cinema is the medium of time, the sculptured monument and acknowledgment of its passing mapped through cuts and rhythms. How can a play that takes often double the length of time that a film maps out do true justice to the words of the original if many of those words are not even spoken? Like many directors to attempt such feats, Jarman knows the difference that the medium simply must adhere to; a difference of form and engagement, a difference of perception and flow. If Orson Welles could amalgamate three plays by Shakespeare successfully into one film in Chimes At Midnight (1965), then Jarman’s task seems almost meagre in comparison. Suffice to say, he completes the job admirably, capturing the true flavour of the play that the more strict and pedestrian adaptations are less concerned with attaining. The fact that the many facets of this flavour also feed naturally into Jarman as an artist perhaps help elevate it further. There’s the feeling that there’s something terrible and perverse at the heart of the island but one that is realised through animalistic aesthetics rather than simply Shakespeare’s prose. The Bard’s words are suffused with a strange form of esoteric glam, as when the confused Prospero debates whether to visit Caliban played with a wide-eyed madness by Jack Birkett. The actor is an apt choice for a number of reasons, chiming with the glam music theme thanks to his previous role as Borgia Ginz – the style and music head honcho in Jubilee – which seems like a side-swipe at the scene Jarman initially sought to capture. Even more prescient, when this relationship is brought over from the last film and applied to The Tempest‘s narrative, it speaks of abuse of power in the creative system more so than it does in the play. Here, the record producer has supposedly abused the singer (Birkett’s Caliban has supposedly tried to violate Willcox’s Miranda,) and so Jarman, perhaps somewhat accidently, has actually provided a comment the viewer can uncomfortably relate to today. In regards to Jarman’s portrayal of other characters, there is a mix of hyper-reality grotesquery and genuine malaise towards the original text. Peter “Soviet spy/ambassador in Dr Strangelove” Bull is a magnanimous Alonso and Heathcote Williams is a wildly eccentric Prospero. Part member of The Cure, part demented banshee, Williams plays the part well if madness alone is all that is needed to sell it. Ironically, he would later find his way into Sally Potter’s Orlando (1992) as the slick boss of a publisher, far and away from his chaotic, wildness stance here. This is however, not a stage play, and therefore Jarman’s work ultimately relies on the gesamtkunstwerk of the whole film. The Tempest is a beautifully dark and lurid piece of celluloid. It basks in the areas of the psyche that Shakespeare only hinted at through potential entendre and a mezzanine of choice words. Jarman is a true shamanistic punk in his revival of such a work, injecting an overdose of bravado until the film is frothing at the mouth with creative acidity. The fact he does this with the most casual care in the world marks the director out as a truly original voice; one that is greatly missed in the age of Downton period malarkey and the mantras of classical texts being purified through endless shades of beige safety when being adapted for the screen.